In a safer Jamaica, more people would ride. These days, three out of every four persons who ask about learning to ride a motorcycle…are female. 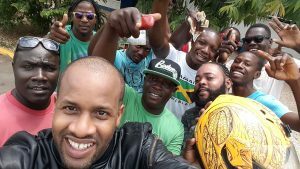 Many are hesitant given the disorder that exists on Jamaican roads. Robbers. Robot Taxis. Drivers on cellular phones. They all contribute increased risk to even the simplest ride from point a to b. How much value could we gain on a national level through a radical reform in this arena? Historically, the subject of “motorcycle safety” in the true sense, was never a political hot-button topic. Some view it as an analogy for controlling “ghetto or Dancehall” culture – from Ninja bikes to RRs and yeng yengs. 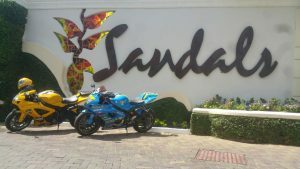 To some extent, Jamaican politics has often viewed motorcycle culture as a serious “crime problem”, especially in light of multiple instances of robberies and other offenses where motorcycles were used. One recent draconian proposal was to ban the importation of the smaller-engined motorcycles that feature in many of these crimes. Another more publicized thought was for the implementation of laws requiring mandatory motorcycle vests and helmets with registration numbers on them as an additional anti-crime strategy. However, what if by pressing towards such knee-jerk reactions, we risk wasting resources, missing a bigger picture or even making things worse? In all honesty, Jamaica has omitted to do most of the things that would make motorcycling as safe, modern and organized as it is in Europe or some parts of the USA. We need not look beyond our mandatory helmet usage law that is hardly enforced…and is admittedly very challenging for police to enforce as is. We focussed on anti-crime policies instead of safety policies. It is not widely acknowledged, however, that the late-80s ‘high powered’ motorcycle ban, never actually worked to reduce crime. There is certainly no evidence in our murder statistics. The “legitimate” high-powered motorcycle ban remains in place today as a part of an old anti-crime solution. The fatality rate among motorcyclists in Jamaica tripled from 2011 to 2015. Only then did “the system” really begin to wake up. The influx of smaller-engined Chinese ‘yeng yeng’ motorcycles proved definitively that even a relatively tiny utility motorcycle can kill its rider if that person isn’t properly trained. The real problem was undocumented motorcycles. Contrary to a common stereotype, legitimate and legally-imported, high performance motorcycles have always been too expensive to be widely used as ‘criminal tools’. As a result, when legitimately imported, these particular motorcycles were not the real threat. Not even 30 years ago. Rather, the national security problem was the fact that undocumented gray-market high performance motorcycles or “barrel bikes” were cheap, easy to obtain and to operate on public roads. In other words, the stereotypical criminal using a loud high-performance bike to commit a crime was usually riding a machine that was not legally imported to begin with. The extreme national security hole back then was that a customs import ban could not stop a bike that customs never officially saw. It still can’t. Statistics will show that between 2004 and 2010, these “bandooloo” high-powered motorcycles began to decline in availability and usefulness. This was a direct result of a much more successful policing strategy. Police started leveraging tax office and titles office changes to seize unregistered, illegally imported and stolen ‘barrel bikes’. Many of these motorcycles were only cheaply available prior to this because they had been stolen overseas, thrown into barrels and shipped to friends and family in Jamaica as ‘flour and household items’. They were illegally reassembled and ridden around with no legitimate motor vehicle documentation whatsoever – uptown and downtown. 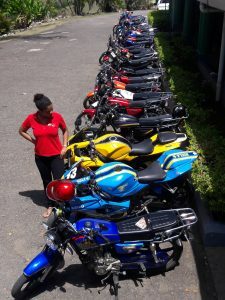 Low cost, legally-imported 125cc to 250cc ‘yeng yeng’ motorcycles have become ubiquitous, replacing “barrel bikes” in terms of popularity among the masses. The yeng yeng’s top speed is a comparatively snail-paced 120km/h. Most police cars are much faster. Never-the-less, murders and robberies are still committed using these relatively slow motorcycles. How much policing time did we waste over the past 30 years focusing on motorcycle engine size? Nobody knows. Nevertheless, current data illustrates that engine size is not that important to criminals. BTB Administrator Tracy Lewis poses beside motorcycles neatly lined up for a BTB Motorcycle Safety workshop. 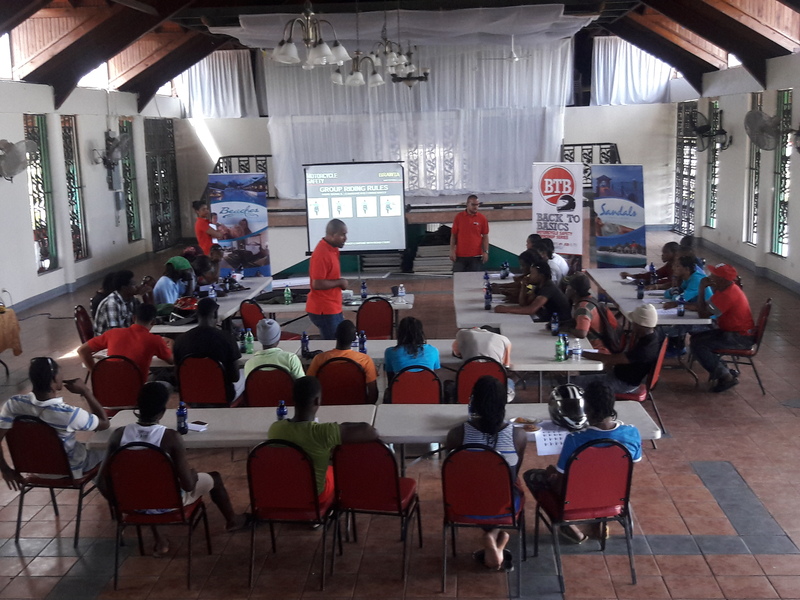 The event was held in partnership with Sandals Resorts International and the NRSC at Negril Hills Golf Course. Note: The two​ high performance motorcycles in the bunch stick out like a sore thumb. It is stunning though, that even with the proliferation of yeng yengs, crime represents far less than one percent of all the motorcycle-related activity in Jamaica. Crime loves disorder. It hates well-organized spaces. We should embrace the legitimate transportation, commercial and recreational roles that motorcycles are playing in Jamaica. Criminality will have a much harder time festering between these lanes. Collectively, it would be healthy for the nation to acknowledge that we’ve been doing this ‘motorcycle’ thing wrong for 70 years. That is long before any 17 year old young man on a yeng yeng was even born. It would be even healthier if we could commit the next three – five years to fixing this problem. Commit as if that young person at risk was our own son or grandson. The BTB Mission team has been tackling the problems as we see it. Our real goal is to empower, while protecting families from grief and hospital bills. Applied nationally, such a change in safety policy will save money and improve lives for years to come.